Turkish internationalists Yeryüzü Postası's statement on the assault on Afrin by the Turkish government. Led by AKP government, an operation of invasion against Afrin has been started with a consensus between all factions inside the state. Boss organizations such as TÜSİAD, MUSIAD, TOBB, unions that defend the interests of bosses against workers and all the constitutional parties have made statements with “national reconciliation” supporting the operation. They became so wild that some bosses dared to say “You can take from workers of my factory to military operation as much as you want.”.By this way, a new phase in imperialist fantasies of state has begun, which is represented by AKP who has been aiming at suppression of the opposition and wild implementation of denial and extermination policies regarding Kurdish question. We can see that power-holders in different countries are rubbing their hands with glee about the Afrin operation. It is understood that Russia and USA are constructing their plan on dividing Syria in line with their spheres of influence and probably they have agreed on it. As far as we’ve inferred from statements of England, they are willing to take a share from oil reserves and other natural resources – possibly, again, via a partnership between Shell and Koç Holding. France wants to re-establish its activity in the region. 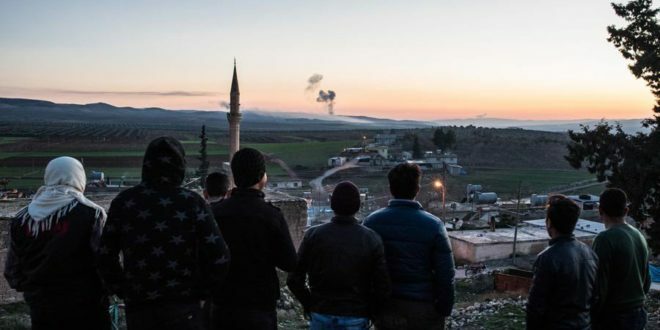 Probably, European governments facing refugee crises are quite happy with the statement of Erdoğan that “3.5 million of Syrians will be settled in Afrin.” And can there be any better opportunity for Turkey to prevent forthcoming strike of metal workers? The war in Syria that motivated capitalists and powers of the world about greater profits haven’t brought anything other than death, destruction and poverty to laborers of Syria. And with this operation, the war will intensify more and the chaos will deepen in the region. This means more death, more poverty and more misery for us. Powers, who seemed to be accompanying Kurdish national movement until now, made contradictory and unclear statements. From this fact, not surprisingly, we’ve seen again that dominant classes and their servitude countries are not acting with ethical motivations or supreme goals. As it was in the World War 1, imperalist powers’ are conducting their competition of spheres of influence via enforcing people in Syria and Middle East to fight each other. Even though they establish strategic alliance with Kurdish movement, they don’t really care what will happen to Kurdish people in the end. Although we aren’t able to know the content of secret and dirty diplomatic negotiations between states, it is obvious that they only care about their interests and this war is dragging not only the region, but also the world into an unknown situation. None of the dominant classes or states that are serving to their interests has intention to stop this war. Statements of UN and EU allow us to see that they don’t have any strategy to do it and they don’t have troops they can use. Structural crises of capitalism are pushing dominant powers to make crazy moves that will drag the humanity into a barbarism era. Just like the same as the period before World War 1 and 2. The only power that can stop this course of events is the working-class. For now, war drums’ voice might be drowning the sigh of young soldiers forced to fight in fronts and their families’ secret cries; it might be drowning the scream of the people in Afrin that are killed or forced to leave their home. Today, voice of politicians from different parties, voice of clowns that call themselves experts in TVs and voice of warmongers’, in general, might be overshadowing the voice of people who are opposing war. They’re all sitting on their comfortable seats and while children of the laborers are dying, they are distributing heroic ranks to themselves. However, they also know that it will not continue in this way. Therefore, the state is trying to prevent the reaction of mass of people, who are killed, impoverished and forced to leave their homes, by increasing the oppression. Police is wildly attacking press statements in public places, people are handcuffed just because they made posts in social media against war and arrested. Against all these attacks, as anarchists, communists from Turkey and other international comrades, we should stick together and altogether continue to raise our voice against war. Furthermore, people of Afrin and people of Turkey who are fighting against this invasion are in need of international solidarity more than ever. This international war, in which the only winners are capitalists and the only losers are laborers of all nations, can only be stopped with international solidarity. We think that to struggle against this war is a historical duty for anarchists, communists and other internationalists all around the world. We are calling all of our comrades to struggle against the operation of Afrin, against AKP’s oppression to war resisters and against all states that are responsible for the actual situation in Syria. War to Palaces, Peace for Slums! 1- those who saw -what may now be called as- the Middle East War as a war against ISIS were wrong. This is a war caused by the retreat of the US from the ME and about who will fill the vacuum. The war has not ended with the defeat of ISIS and and now threatens to expand beyond the borders of Syria and Iraq, almost reaching to Europe with Turkey's mperialist invasion attempt. The US government is clearly against this and the situation risks escalation. As the Erdogan government loses its face in Turkey, it is trying to postpone the backlash against the autocratic policies of the state by fueling the nationalist hysteria. Today AKP also banned a strike concerning the wage negotiations of 130.000 metal workers and the mood of the workers suggest that they may defy the ban and go on a wildcat. This happened recently in 2015 and may happen again. The situation is really tense in Turkey right now. Those opposing the war are imprisoned daily. Even a simple anti-war tweet can easily lead to an indefinitely prolonged arrest without trial, as it already happened to tens of people during the last 7 days. Statement now up on the Communist Anarchism site. It's good to see a solid anarchist communist response like this, rather than some of the more nationalist inspired calls for solidarity. I welcome this statement as an expression of internationalism against the support for and donations to Kurdish nationalism and imperialism generally. I think that Mikail makes a correct point about the weakness and weakening of the US in the Middle East and its growing tensions with Turkey. I agree with the point in the response about the role of Britain which has historically been involved in using the Kurds as cannon-fodder and is presently involved in supplying and training the Kurdish forces (according to the British Ministry of Defence - send donations direct to Whitehall) for its own imperialist interests. 11 members of Turkish Medical Association’s central council detained over their declaration calling the war as a "a matter of public health" and calling for an immediate peace. ICC response to the leaflet on Afrin above which can also be considered a response to the growing anarchist clamour for supporting nationalism and imperialist war in the Middle East.